Remember the guerrilla art installation I wrote about in November? 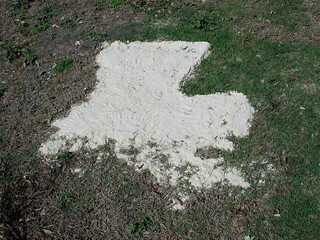 On the Jeff Davis neutral ground, a pitcher of water was suspended over a map of Louisiana drawn in sand. 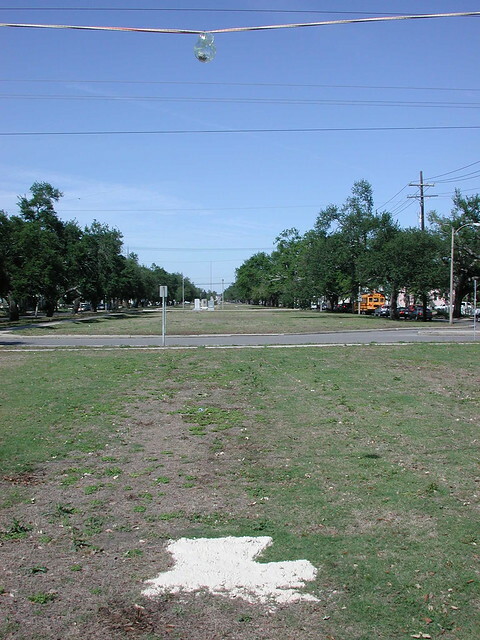 Over the months the sand image of Louisiana became formless and then dissolved into the grass. 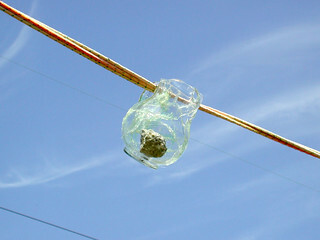 The pitcher of water disappeared recently, and I considered removing the empty cable which held it myself. Then, yesterday, I noticed the pitcher was back. Only this time, there’s no water but a rock inside the pitcher. There’s no mention of the refurbished installation at Art in Action, at least not yet. I assume this is the work of Jonathan Traviesa, but who knows? Who knows what it means? Update: Art in Action has posted the full story. I’ve been meaning to look up your old post on that because I couldn’t remember “Art in Action.” I thought the pitcher looked like it had been broken and glued back together and wondered if the the rock had been found next to the broken pitcher. But the rock couldn’t have knocked down the pitcher without breaking the handle. Still, as a twelve year old, if I had seen the pitcher and found the rock, I’d have been tempted to test my aim. I’d like to think I would have known better.